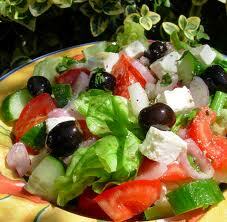 Place all salad ingredients, except for the black olives, together in a large salad bowl. Mix all the salad dressing ingredients together. Toss dressing over salad mixture. Garnish with black olives. Serve.